Learn the swashbuckling adventure sport of skiing at the picturesque hill station of Gulmarg and spend an enriching vacation with your family or friends. For six days in the chilly, winter of Gulmarg, you'll train with certified skiing instructors to learn and practice various skiing techniques. By the end, you'll be zipping down the white-washed, bunny slopes of Mt. Apharwat with a fluid and smooth motion. This skiing course in Gulmarg is perfect for beginners with no experience, even kids older than 10, with an avid interest in learning to ski. NOTE: A minimum of 8 travellers are required to book this trip. If you're simply accompanying a course participant, Gulmarg is surrounded by dreamy landscapes with plenty of things to do. 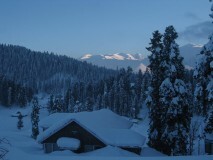 Often called the heartland for winter sports in India, Gulmarg attracts skiing enthusiasts from all over the continent. The slopes of Mt. Apharwat, located just a short cable car ride from Gulmarg, create the perfect conditions for skiing, as the snow begins layering in the season of winter. The peak of the 13,800 ft mountain offers beautiful views of even taller peaks in the Pir Panjal range. 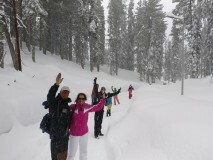 • Learn skiing at Gulmarg in small groups with personalized attention. • Visit the picturesque hill station of Gulmarg. • Go skiing on the snow-laden slopes of Mt. Apharwat. • Spot mountain peaks of the Pir Panjal range. Travellers are required to sign a liability and indemnity form before beginning the course. 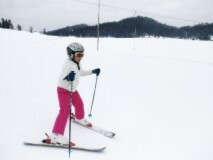 Travellers are required to adhere to instructions of the skiing instructor during the basic skiing course in Gulmarg. 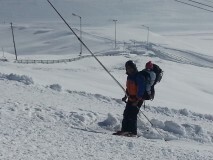 Consumption of drugs is strictly prohibited during the basic skiing course in Gulmarg. For cancellations made more than 30 days before departure of the Gulmarg skiing course: 70% refund. For cancellations made 15-30 days before departure of the Gulmarg skiing course: 50% refund. For cancellations made 7-14 days before departure of the Gulmarg skiing course: 25% refund. For cancellations made less than 7 days before departure of the Gulmarg skiing course: No refund. The itinerary displayed for this basic skiing course in Gulmarg is subject to change, depending upon the day's weather conditions and logistical considerations. A specific itinerary will be decided the night before, or early morning, of the day. The tour operator reserves the right to cancel or alter the itinerary of the basic skiing course in Gulmarg to maximize the safety of travellers as well as staff. Land at Srinagar International Airport, where a private vehicle will be waiting to drive you to Gulmarg. The 2-hr drive to Gulmarg will proceed via Tanmarg, where the driver will halt to put on snow chains over the tyres. After arriving at Gulmarg, you'll meet your skiing instructor and get the equipment in order for your skiing course. Hit the slopes after a briefing session and learn the moves to take on the easier, bunny slopes. Overnight at Gulmarg in hotel rooms. 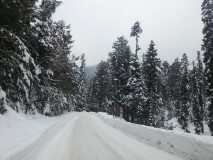 The road to Gulmarg, with snow-covered pine forests on either side. Begin the second day of the skiing course in Gulmarg and work with your instructor to learn and practice the basic skills and techniques of skiing. Depending on your ability and health, the skiing instructor will customize the exact activities of the day. The itinerary is subject to change, depending upon the day's weather conditions and logistical considerations. A specific itinerary will be decided the night before, or early morning, of the day. Begin by learning to manage the ski lifts. Begin the third day of the skiing course in Gulmarg and work with your instructor to learn and practice the basic skills and techniques of skiing. Depending on your ability and health, the skiing instructor will customize the exact activities of the day. Learn to ski over the bunny slopes of Mt. Apharwat. Begin the fourth day of the skiing course in Gulmarg and work with your instructor to learn and practice the basic skills and techniques of skiing. Depending on your ability and health, the skiing instructor will customize the exact activities of the day. Fun for the entire family, the kids usually learn faster. Begin the fifth day of the skiing course in Gulmarg and work with your instructor to learn and practice the basic skills and techniques of skiing. Depending on your ability and health, the skiing instructor will customize the exact activities of the day. 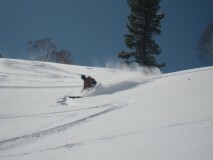 Dash down the smooth, snow powder on the slopes of Mt. Apharwat. Depending on your flight time, you can hit the slopes for a parting lesson and put some finishing touches on your skiing technique. Board a private vehicle back to Srinagar airport. Your trip ends here. Scenes from Gulmarg, after a fresh bout of snow. All equipment required for skiing: skis, poles, boots, helmets etc. All apparel required for skiing: suit, jacket, pants etc. Overnight at Gulmarg in hotel. Land at Srinagar International Airport and transfer to your hotel in a private vehicle. You'll be accommodated at Gulmarg in the Shaw Inn hotel on twin-sharing basis. Today's meal package includes lunch and dinner only, but you may visit any of the restaurants en route to Gulmarg to have breakfast at an additional cost. You'll be accommodated at the same Shaw Inn hotel in Gulmarg on twin-sharing basis. Today's meal package includes breakfast, lunch and dinner. Any beverages like tea, coffee and hot chocolate ordered via room service are included in your meal package as well. Today's meal package includes breakfast only. Check-out of the hotel and travel back to the airport. Your trip ends here. Srinagar airport is connected to most major cities of the world via frequent flights from Delhi. If you're travelling from a city outside India, you may board an international flight to Delhi and continue with a connecting flight to Srinagar. 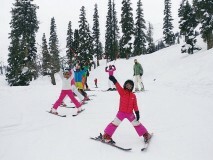 The tour operator will arrange your transport to the start point of the Gulmarg skiing course.